The Blarney Stone — Myth or Legend? In the summer of 1962 in Plymouth, England I was serving aboard the Royal Navy submarine HM/SM Taciturn. On weekend leave I suffered a severe head injury as a front seat passenger in a shipmate’s car. Three weeks in hospital and 30 stitches later I was sent home on sick leave. Whilst on leave my brother-in-law suggested I claim damages and took me to a solicitor. I recounted what little I remembered about the accident and gave the lawyer a newspaper clipping, the only real information I had. When sick leave expired I was posted to HMS Dolphin, the submarine base in Portsmouth. I remained there until declared fit for sea duty almost one year later in May 1963. I reported to the drafting office for my next assignment. I had long since forgotten the solicitor or any hope of receiving compensation. The submarine base maintained a complete spare crew. If a submarine found itself short a crew member, due to health or such, a replacement was usually available. It was to spare crew I now found myself posted. I was given several forms to fill in and deliver to appropriate departments. It was important the pay office knew my whereabouts if I expected to be paid. It was equally important the post office had my new address if I hoped to receive mail. However, the first priority was to transfer with my kit to the spare crew accommodation. By the time I moved into my new accommodations it was already late. I decided the forms could wait until the following morning. That night I quickly fell asleep. I landed onboard as they were about to remove the gangway. I was unshaven, unwashed and now underway. The boat was heading out to operate in the Irish Sea with a visit to the City of Cork on the weekend. Thursday at sea being payday, everyone was paid. Everyone except me that is! I was almost broke with maybe five shillings to my name. The chance of borrowing from a shipmate was nil. Not a permanent member of the crew, loaning me money was high risk. I could disappear as quickly as I had arrived. Saturday morning, alongside in Cork City I was free to go ashore. Opposite our gangway was a pub. It didn’t open until noon. However, with a discrete tap on the side door my shipmates and I were quickly ushered inside. The interior was dim, blinds still down. We ordered pints of Guinness and headed to a table by the fireside. As our eyes became accustomed to the gloom we saw a Garda (Irish Policeman) standing at the bar. A few pints later and my funds reduced by half I returned onboard for lunch. Levity in a seaman’s mess usually increases after the daily noontime issue of rum. This was the case aboard Totem. Someone suggested we head out of town to Blarney Castle to kiss the famous stone. Having imbibed a tot and two pints of Guinness, kissing the Blarney Stone seemed an admirable idea. The bus fare depleted a further sixpence from my dwindling funds. Arriving at the castle we were directed to climb a circular stairway to the top of the tower. Here we found the Blarney Stone and an enterprising photographer. For one shilling he would take our photograph kissing the stone. We readily agreed, we surely needed a record of our lips touching this famous stone. After paying the photographer I couldn’t afford return bus fare and had to walk the five or so miles back to town. I returned aboard Totem, depressed, my feet aching and my pockets empty. When I entered the mess I noticed the mail had arrived. I showed no interest as there would be none for me. Like my pay doc’s, my change of address was sitting in my locker back at the base. Therefore I was stunned when a shipmate asked if I’d got my letter? What letter? It had to be a mistake. It couldn‘t be for me. Nevertheless, on the table was a large official-looking white envelope with my name clearly printed on the front. I quickly tore it open to find it contained several typed pages. But what immediately caught my attention was the attached cheque. It was from my lawyer, a settlement for my injuries in the sum of one thousand pounds. Never in my life had I held such a huge sum of money in my hands. A few hours earlier I had kissed the Blarney Stone with only small change in my pocket. Now I was rich beyond my wildest dreams. Coincidence? Or the Luck of the Irish? You decide! 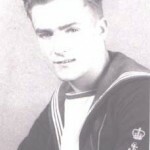 Frederick (Ben) Rodgers served a total of 25 years in the British and Canadian Navies. 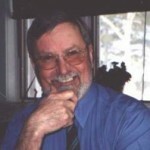 Now retired and living with his wife, Linda, in Ebenezer, Prince Edward Island, he has published a 400 page memoir titled Lily & Me and is presently working on a sequel. For more information visit his website at www.irishroversbooks.com. 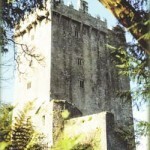 The Blarney Stone has woven around itself a unique tradition of myth, legend and romance. It is said that the secret of the holy stone was given to Cormac MacCarthy, King of Munster by the local witch whom he saved from drowning in the lake behind the castle. It is also said that the stone was brought back from the Crusades and made into two halves. One is the Stone of Scone also known as the Stone of Destiny, the other half was given to Cormac MacCarthy by Robert Bruce of Scotland in gratitude for the Irish army of 4000 men, which was sent to help him at the Battle of Bannockburn in 1314. Whatever its origins, through the centuries the stone has succeeded in strengthening the mystical romance and legend that reaches to the four corners of the world, as is evident by the thousands of people who visit Blarney Castle every year just to kiss this mysterious stone in hope of receiving the gift of eloquence or perhaps to capture a little of the mystique that is the Blarney Stone. What a lovely story…or is it just a story?? ?My Irish roots go back to 1776 where the parents of my gr. gr. grandfather were born & raised. il;liam Matchett came to the shores of the Miramichi in the year 1815 at the age of 15. They tell me he was a stow-away on a ship destined for Chatham, which was a great ship building town at that time. Oh, to be able to trace my heritage with some degree of authenticity…it would be a glorious day for me, to be sure. I turn 75 on the 19th of this month of April, and I long to know who the parents of my gr. gr. grandfather were. Was it James Matchett of the era? …Or Alexander??? To kisss the Blarney Stone wold be a crowning glory to my Irish Heritage. Loved your story. Hope I can locate you on line again sometime. Regards & cheers from here. Rae Matchett ( Here is Moncton, New Burnswick Canada) I was born & raised on the Miramichi in a small town called Newcastle, N.B. Have a great & holy Easter. I was wondering if you were kin to these people. Mable , Bobby, Lillian, Lorna or Elizabeth Matchett, they use to live on Jane St.in NewCastle…where I was raised. What a joy to hear from someone from the old neighbourhood after such a long time away. If you were raised on Jane Street, Newcastle, maybe we know each other??? The only “Helene” I can remember on Jane street growing up was Helene Ullock. About the query on the Matchetts…….I went to school with Mable…same class at Harkins Academy & Harkins High…Bobby was one or two years younger, as I recollect, and yes Lillian & Lorna rings a bell also. …..and, to answer your question Helene, the Willis Matchett relationship was not close; not sure of the lineage but I haven’t come across their geneology data when digging for my own roots. Thanks for your e-mail & have a great day. I was Willis’ daughter and I remember your parents. I used to go to your father’s store often when I was young, as we lived nearby. I thought my father & Ed were cousins. They knew my family. Do you own a book called The Old North Esk Revised? That has some history in it. This is for Eliabeth McGrath. Hi Elizabeth, if you were Elizabeth Matchett, I remember you as a child. I lived across the street from you .My parents were Ed and Doris Robichaud.You were much younger then., I was more Lillians age.I’d love to have that book you mentioned The Old North Esk Revised.If you will, please write to me at Bettyboop@communicomm.com . Daughter of Willis & Annie??? How is everything in your world? So nice to hear from former neighbours. You must be the baby of the family, right? It is neat to converse with someone who knew my Dad & Mum so many years ago. Are you living on the Miramichi today? I read about Bobby’s passing some time ago in the local paper Is Mabel still active. The last I heard she was married, retired and living “up river”. It would be great to talk to her one day soon. My e-mail address is rcmpower2@aol.com. I would love to hear from old friends from the past. Time for some Zeee’s Elizabeth. Take care & drop a line if you can. I was racking my brain and I think I finally came up with your Mum’s first name. It was Anne or Annie, right? When we were growing up we wouldn’t dare to address our elders with anything but Mr.or Mrs. I do have the book on The Old North Esk Revised by: W.D. Hamilton??? also The North West Miramichi by:Doreen Menzies ~ Arbuckle. I have been remiss as of late on the genealogy aspect….now I am leafing through the pages again…thanks for the prompt.Did you marry into the McGrath family that operated the shoe store on the square in Newcastle? Stanley??? So long ago, eh? Yes, my mother’s name was Annie. My brother mentioned working for Ed in the store one time. Mable & Lorna remember your family and of course, the Robichauds across the road and the Watters’. Yes, I was born in what we call the Old Stothart house and I have a brother Daryl, 3 yrs. younger than myself. Ned McGrath was related to my husband’s father. I married Fr. Henry McGrath’s (passed) nephew. Yes, it’s been about 10 yrs. since Bobby passed. He was 63. Mabel has been retired and lives in South Esk with her husband. Helene, I bought my book from the author’s mother of whom I am related. She only had a few left and I bought one for each of my family years ago. If I come across another book I’ll let you know. Yes I would love to pick your brain. Andrew Matchett was Uncle Andy, my Dad’s brother. So, we ARE related. I bought my two genealogy books from Tommy Gallivan’s Book Store in Newcastle. That store is now closed. Must be a similar book store in the area? Yep, Malcolm was the youngest and Isabel was next, and the only girl in the family. Poor Isabel, eh? Malcolm passed way on May 15 / 2005 at the age of 63. Co-incidental, or what. Isabel is in Edmonton with her husband Nolie Gauthier retired from the RCAF.Still healthy….for old folks eh? I don’t have your e-mail address Lorna….feel free to contact me at rcmpower2@aol.com. P.S.Good to hear Mabel is happy, as you are, with your family.Give her my fond regards. 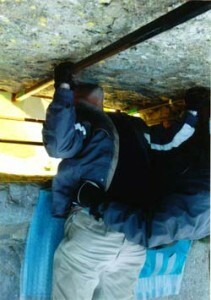 Of course every bloody Irishman should kiss the Blarney Stone. I have not made it there yet and time is getting on….but my hopes are high that I will get there before I die.